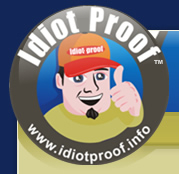 By submitting your site to Idiot Proof™ you have the opportunity to be approved for being an official Idiot Proof site. Being Idiot Proof brings many advantages that any webmaster would love, but most of all - it means you have an easy to use and well maintained web site that surfers will love! 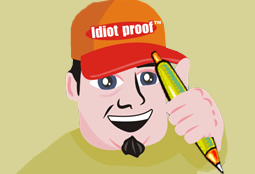 All it takes to become an Idiot Proof™ site is to fill out a quick and simple form and we'll evaluate your site based on a number of criteria and the opinion of our professional team of web design specialists. If you're selected, you'll be able to add our nifty emblem to your site, be part of our directory, and much more. Submit your site today! ©Copyright 2014 Idiot Proof. All rights reserved. Unauthorized duplication in part or whole strictly prohibited by applicable international copyright laws.